The ATA-200 series amplifiers employ a special NS circuit topology developed by Audes. Components used throughout the amplifiers are selected as the ‘best for the application’. Audes designs and manufacturers its own toroidal core power transformers with a low primary current, employing precise winding and sectioning geometry. 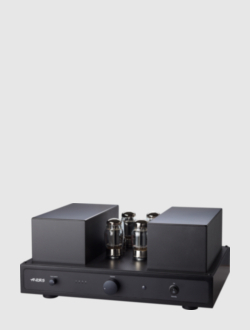 The heater and the plate voltages can be turned on and off independently, which extends tubes’ lifetimes and allows for a power-saving standby mode during a pause in a listening session. The ATA-200 series amplifiers come with a remote control, which can be used to adjust the volume as well as select one of four line inputs. The volume knob and the input selector are also to be found on the amplifier’s front panel. LED indication is used to display which input is currently in use. When the amplifier is turned on or the input is change the output level is automatically reduced as a protection measure.